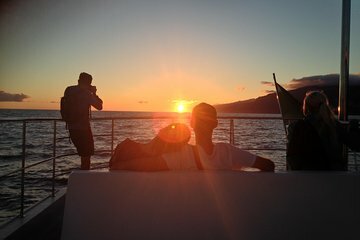 See the sun set over the Atlantic on this 3-hour catamaran cruise from Funchal. Nothing is quite like the glow of dusk over Madeira. See it from the comfort of a catamaran on this sunset cruise, departing from the Funchal Marina. Your expert crew will welcome you aboard, then set sail for a memorable experience. During the excursion, keep an eye out for native marine life, like the local dolphins and whales. Then return to shore and continue your stay on Funchal. Good, but it got very cold, so much so, blankets were handed out. Couldn't fault it, fantastic value for money, got to see lots of dolphins and the crew were attentive and helpful throughout. Amazing! We didn't see any whales but lots of dolphins, the sunset was stunning, the staff lovely, a perfect evening. Snacks and drinks for sale, I enjoyed a gin and tonic while absorbing the experience!